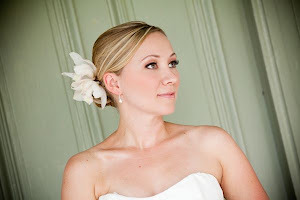 Award Winning Bridal Makeup Artisty serving Maryland, Virginia, DC, and Beyond. What a difference a set of falsies can make! When I say falsies , I am referring to false lashes! They are a dream come true for those of us who are not blessed with long luscious lashes, and a way to turn up the volume for some of us who need more volume or curl. As a bridal makeup artist, I have seen brides and their bridal parties transform after falsies are applied. I personally prefer the strip lashes opposed to the individuals, but offer both. One of the most important parts of a good set of falsies , is ofcourse the application of them. Not every client of mine has been able to withstand the eyelash application proccess , due to eye sensitivity, nerves , contacts or the idea of having a lash in their line of vision makes them feel uneasy. So this is not ideal for everyone. But worth a try! Lifting may occur or a shifting of the lashes to the wrong area , causing glue to stick in places on the eyelid ect. The proccess of removing excess glue or resetting a lash can take more time and every makeup artist can agree that occassionaly you come across a lash that is truly a "lemon" and requires a replacement. The impact lashes have in photographs is tremendous especially for those profile shots. Very glam and for aging women, takes 10 years off, a much more youthful look. Read My Reviews On Wedding Wire! Would You like to schedule your makeup trial run? Phone 240-320-3232 ( phone consults by appt only) Pricing info is given via email only. Your inquiry will be answered within 24 hours or less! I will be sure to get back to you with all of the info you requested in less than 24 hours!